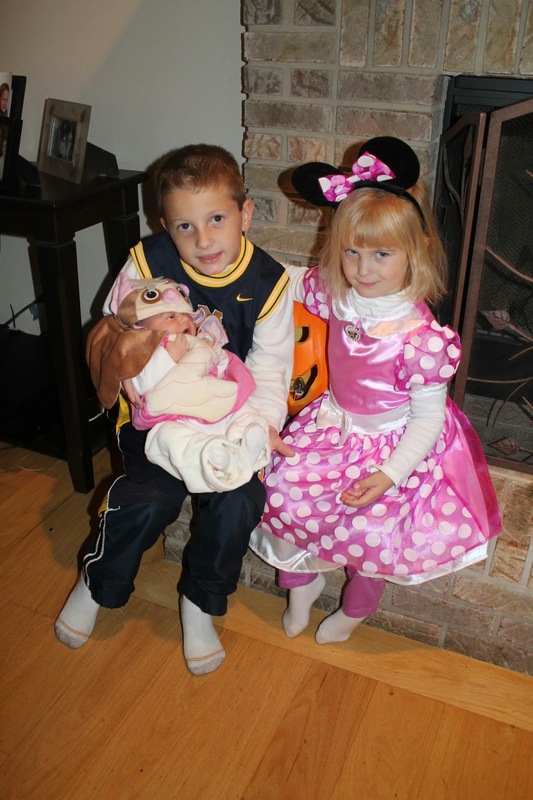 Three Kids and a Dog: Happy Halloween! So last Thursday on Halloween, we once again made the trek to the suburbs to trick or treat in my brother's neighborhood. We thought our kids would be trick or treating in their new neighborhood by this time but no such luck. Anyway, all of the kids braved the rain and put on their costumes complete with rain gear. 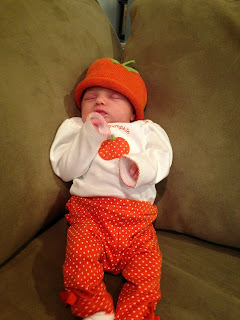 Hailey even went out too although she slept in her stroller most of the way. And for those of you who think I am crazy to bring a newborn out in the rain, she had a rain shield over her stroller and was plenty warm enough with her costume on. 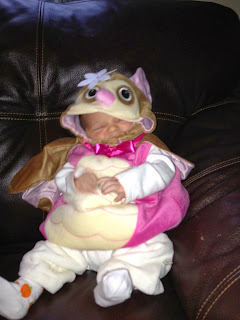 Yes, she had a costume too! Austen decided to be a University of Michigan basketball player this year. No idea why he loves Michigan when his parents went to two other Big 10 schools, but he does! Peyton insisted on being Minnie Mouse even though I wanted her to be a cute, little bumblebee! At least I got to pick out Hailey's costume....she was an adorable little owl. The kids got so much candy. Austen had to count his for school and he had 128 pieces and that doesn't even include what we ate the day before we counted! 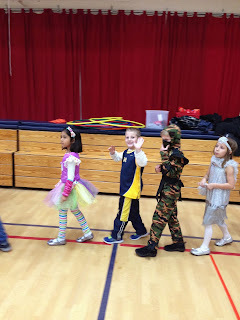 He also participated in his school's Halloween parade. They all get to go home for lunch and come back in their costumes. Of course, our lunch was at a restaurant and Austen changed in the car but it was fun to have that special time with him. I am looking forward to moving into our new house next week, but not all the packing and unpacking that goes along with it. Hard to pack when you have a newborn not on a schedule and most of your day is spent in the suburbs shuttling kids to school/activities and not at home. I think someone else should just pack and move me. I need a relocation package!